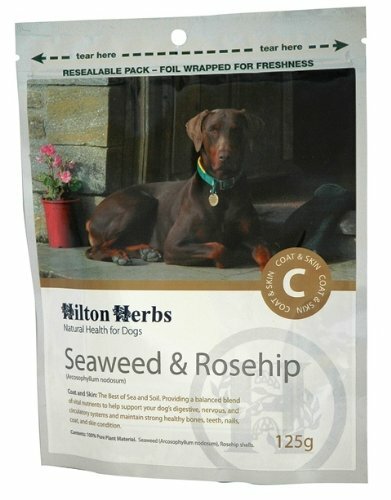 Hilton Herbs Seaweed & Rosehip combines a blend of nutrients which help to support your dog's nervous, circulatory and digestive systems, as well as encouraging ideal skin, coat, teeth, nails and bone condition. It provides your dog with elements such as Iodine, Iron, Sulphur, Calcium, Copper, Magnesium and Selenium along with Vitamins Beta Carotene, B1, B2, B12, C,D& E plus 20 amino acids. Kelp seaweed (Ascophyllum nodosum), Rosehip shells (Rosa canina). Add to feed on a daily basis and divide required amount between two meals where possible for best results. Comes with a 2.5ml scoop inside the pouch. There are currently no questions for Hilton Herbs Canine Seaweed & Rosehip - be the first to ask one!